Sales/Marketing Collateral Management & Value Proposition Builder Systems. YOUR SALES & MARKETING COLLATERAL IS NOT BEING UTILIZED. AND IT’S COSTING YOU. With many industry, customer, stakeholder and meeting types to manage, it can be very difficult for front line sales people to tailor their message to fit the exact customer conversation they are having, so it ignites the customer to move forward in the buying process. At least not without spending a lot of time on research and preparation. 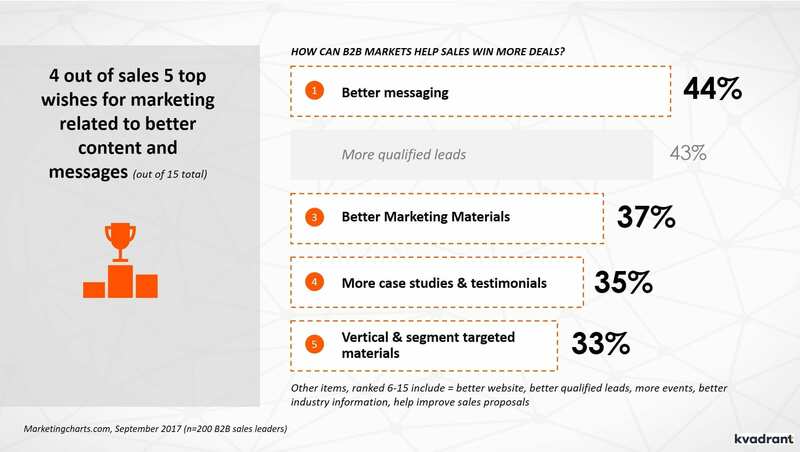 We know that the most successful B2B sales reps are those who tailor their message to the customer, depending on their industry, role, place in the buying process and, of course, what product is in focus. 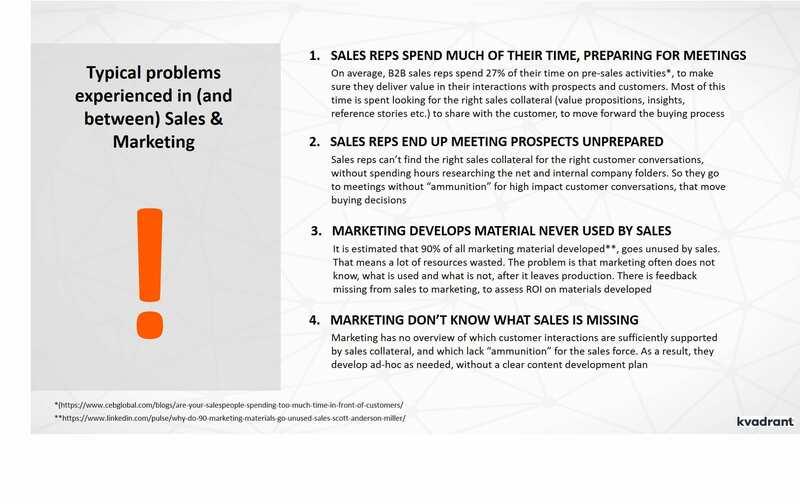 Imagine a sales rep selling 5 different products, to 5 different industries, managing 5 different stakeholders in a 5 step sales process, at worst that’s 625 different types of standard interactions each rep must be able to tailor message and approach to. With such complexity message leak seems unavoidable and sales reps end up spending way too much time preparing for meetings, finding the right material from marketing, “hidden” somewhere on a company folder. Onboarding new sales reps takes much longer time than needed because it is troublesome to learn to manage such complexity by heart. 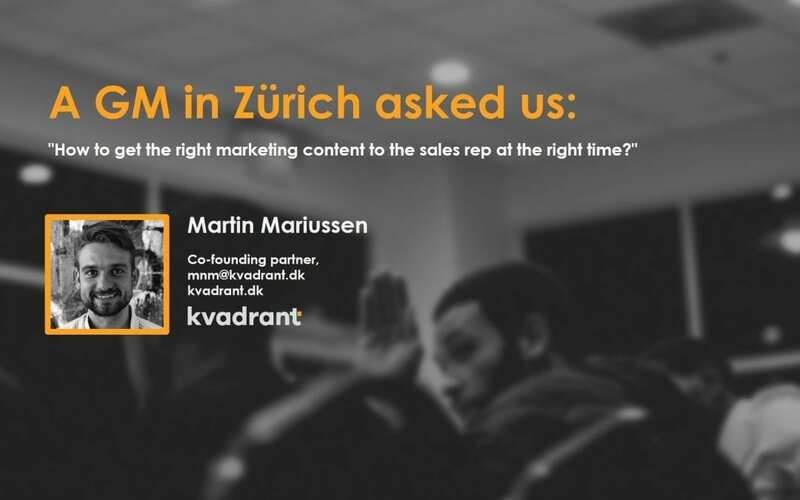 Decide on need for tailoring: We recommend that content delivered to the sales rep is tailored to the specific situation with regards to who they are meeting with (what industry? what company type? what stakeholder?) and what they are meeting about (what pain/solution? where in the buying process?). We urge you to be careful not to set the requirements for tailoring too high (at least not initially) as it increases the level of complexity exponentially. Digitalise & tag content in searchable database: Start by labelling existing content with tags on industry, company type, stakeholder, pain/solution etc. so they are identifiable for specific situations. If AI is used, train the algorithm. Create sales reps decision flow: Give sales reps a front-end interface where they answer 4 questions about the sales meeting about to take place and are presented with relevant content to use in that specific situation. 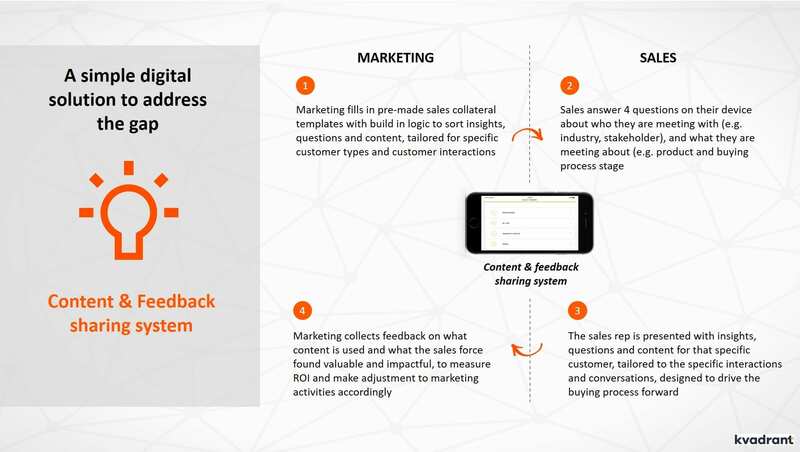 In a company with a strong data and analytics foundation, the system might proactively suggest relevant content and messages for sales reps without them having to answer any questions (i.e. “you should probably call person X to talk about Y). It’s important to notice that a Sales/Marketing Collateral Management Tool is only as good as the content you put into it and the process you design around it. Make sure your tool Ignites customer interactions with relevant conversations and content. Ootherwise your technology investment will be wasted at best, damaging at worst.